I want to thank everyone who have attended or listened to our two trainings this past week! I received very favorable review on both. The Mid-Week ATTS training about how to achieve more consistent trading is very good and provides action items for all traders to start working on as we all get ready for 2015. The Early Warning Alerts for Index ETFs Bonus training provide the ground work for the service to all members who have joined this service. Text Alert Service will be tested and activated this week. This bonus service will be at no charge to Premium and Early Warning Alert members. General Market Observation: Going into this weekend it seems like the market is “on the verge”—On the verge of continuing to climb the wall or falling down the hill. I liked the comment made in IBD’s Big Picture in this Monday’s paper, “…the hesitation in the market is leaving chart watchers wary.” That basically sums up my current posture. It’s too late to get long the indexes without a proper entry action point and too soon to look for short trades because the price action is still in an uptrend. It is clear on the Index charts both daily and weekly that upward momentum has waned but downside momentum is absent. I wonder if the apex for 2014 has been achieved and now we mark time through the end of the year with only a muted Santa Claus Rally. There is rumor that the Russians are going to start selling Greenbacks. Could this be because China has now slightly over taken the USA as the world’s number one economy? Will there be significant ripple effects if this rumor is true and contagious? SPX: The SPX pushed to all-time highs this week. Unfortunately momentum did not do the same thing. The is clear support in the 2050 zone and resistance at 2080. I guess I’m one of those wary chart watchers seeing that we may be putting in another rounding top like formation. When I say I see topping action I’m not saying the market is going to fall out of the sky and go into a bear market. 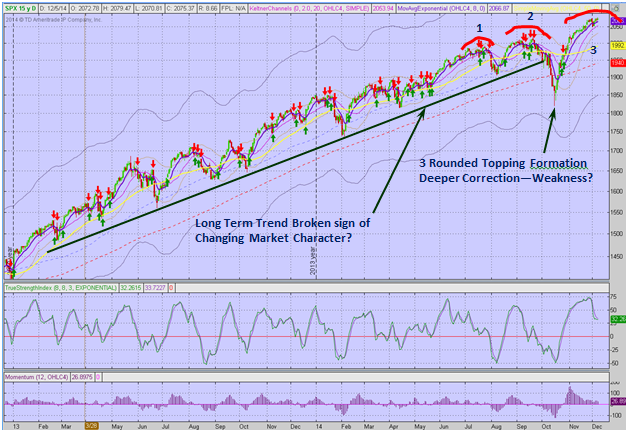 I am saying that a correction or at least a pullback may be on the horizon. Take a look at the daily chart below covering the last two years. See how the character of the last correction was different and deeper that those over the past 2 years? This is a clue that storm clouds are forming, but not a sign to run for the exits yet. Also note that with each of the past two rollovers the topping action took several weeks to complete before any significant downside trades arrived. Nasdaq 100: Continues to climb toward the all-time highs set back in 2000, fourteen years ago. As of Friday it is about 11% below this level. The Nasdaq remains the strongest of the Indexes. While the SPX is showing signs of weariness, the NDX is merely slowing a bit but still pushing higher. Currently over 80% of the stocks on the NDX are living above their 50 day SMA, this showing that the current NDX rally is broad. Russell: The Russell showed some life this past week. Price continues to work within a range between support and resistance zones marked by 1191 & 1150. Notice how this current pause is different from the other rollover tops the Index has demonstrated this year. 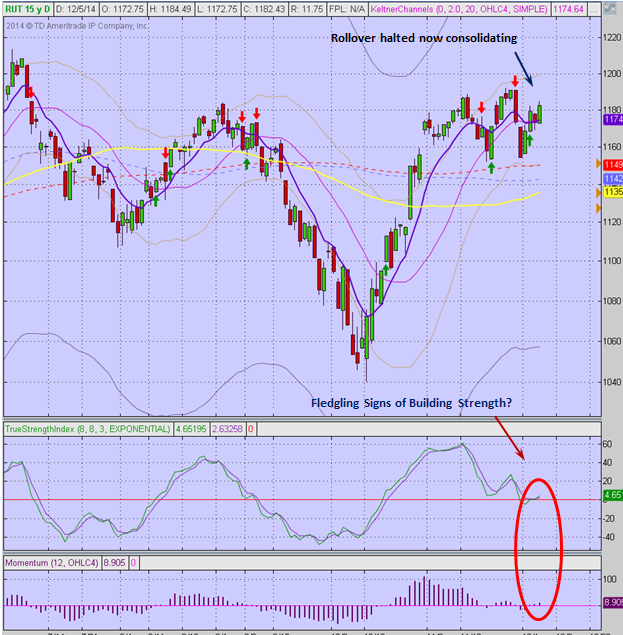 Is this strength coming back into the Index or just a slight delay before repeating a similar pullback? At this point this is the question. Monday’s drop appeared to be the start of a fall, but the convergence of the 100, 200 & 50 day moving averages is holding. Note how the 50 day has actually moved into a positive up slope. If price continues to bounce from current levels and support holds the yearly highs may be tested in the 1212 zone. The first week of December was dedicated to purging the watch list of laggards and replacing them with growth stocks showing more leadership potential. This list will be posted on Monday. The TSLA demonstration trade will be closed at the end of 2015 but is still active though no triggers have been sent out this past week. I think that while this strategy is a good one, the management demands takes away from focusing on the simple process of trading individual stocks. Here is the tracking sheet we’ve used since June. December did get off to a good start with a put position on TSLA based off of last weekend’s Trader’s Report. This alert did not go out due to work improvements in the other areas of ATTS including the new Text Alert system. 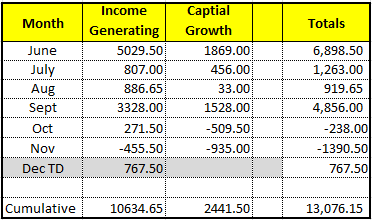 For those just joining Active Trend Trading, the reason for the difference between the Margin and IRA account returns is because the Margin account up until June of this year was used as a test account for various strategies. On June 1st we have only made trades using the ATTS system in this account along with a demonstration trade with TSLA. This account is up 13.07% over the past 6 months. Outs & Ins: AutoNation was added to this week’s IBD 50 list. It looks to have completed an irregular cup formation and price needs to generate a proper entry Action Point. We may see a handle to the formation over the next few weeks because the current move up is with low volume. Some of the other promising stocks on the current list include, VIPS, TSM, CALM & NTES. NTES does not have the volume profile of over 500K shares traded per day. 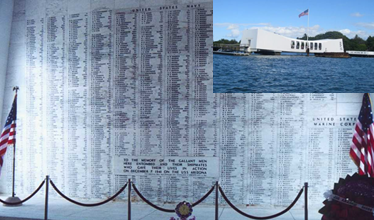 The Running List is now up to 209 stocks and will be zeroed out at the end of December and replace by the first IBD 50 list of 2015…..
Off the Wall: Today is the end of a journey for the few remaining survivors of the attack on Pearl Harbor 73 years ago today. Today was the last formal ceremony with these few survivors because they have grown too old to make the yearly trip to the memorial. This saddens me because this great generation has almost all passed away and gone on to hopefully a better place where memories will be replaced by wonderful reunions with their brothers and sisters-in-arms from so many years ago. My father was part of this grand generation of young Americans who faced the perils of war. Dad was on a Navy ship sailing for Pearl Harbor when the attack happened. His ship sailed into the harbor a few days after the attack and the memories of destruction and devastation stayed with him his whole life. One of the most wonderful times he and I had together was visiting the Arizona Memorial and hearing his stories of valor, fear and hurt. At that time I promised that I would always remember the sacrifice of his generation and pass it on….And so I will! Love you Dad!